Everyone has a favorite potato combo, but it’s time to mix it up. Bring these classic ingredients together with elegant flavors in this Roasted Potatoes with Cheese and fresh Chives recipe. With crisp exteriors, soft potato-ey insides, Parmigiano cheese dressing, and freshly harvested chives atop, this delicacy is a family favorite that can be served as a side dish, appetizer, or a brunch treat. 1. Preheat oven to 425 degrees with the oven rack in the lowest position. 2. Cover potatoes with cold water in a large pot and add salt. Bring to a boil and then simmer until potatoes are just tender when pierced with a fork, about 10 minutes. Drain and cool potatoes. 3. Brush the bottom of a baking sheet with olive oil. Slice potatoes and mix in olive oil, garlic and pinch of salt. Arrange on the baking sheet and roast until gold brown, about 30-35 minutes. 4. Reduce oven temperature to 350 degrees, turn potatoes over and sprinkle with cheese. Return to the oven for about 10 minutes. 5. 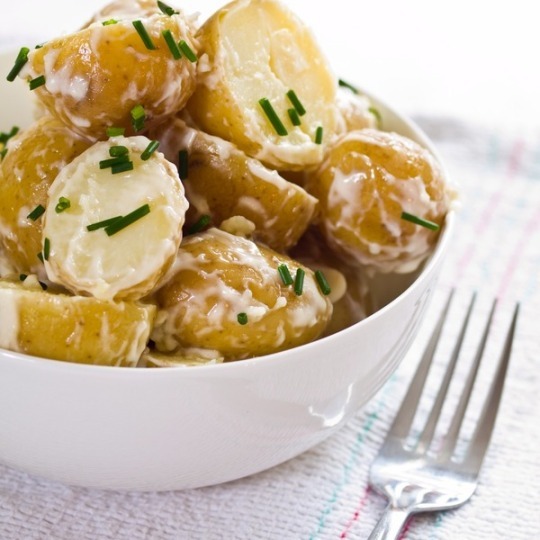 Plate the potatoes and dress with chives. December 12, 2017 by Corinne L.